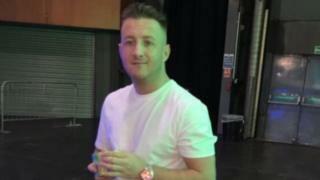 Kenny Reilly, 29, was targeted as he sat in the passenger seat of a silver BMW at a junction in Maryhill. He died in the city's Royal Infirmary two days later but, despite a series of appeals, the murder remains unsolved. Mr Reilly was critically injured at about 22:20 on 16 April last year at the junction of Maryhill Road and Bilsland Drive. Police said a man wearing a black balaclava, who was a passenger in a people carrier, got out and fired several shots at him. The burnt out black Ford S-Max was discovered later that night in Craigieburn Gardens, Glasgow. Det Chief Insp Stevie Wallace, of the Major Investigation Team, said: "Despite the passage of time, I am determined to trace those responsible for this murder. "My thoughts remain with Kenny's family who have been through enough over the past year." He said hundreds of people had been interviewed and thousands of hours of CCTV footage examined in the past year of the investigation. The officer added: "We still need to speak to anyone who has any information about who is responsible for shooting Kenny Reilly or about the vehicles involved. "Please don't think that the information you hold is insignificant, it could be the vital piece that will move this inquiry forward." The vehicle, which had been fitted with false plates RE57 EUU, was stolen from the University of Glasgow School of Veterinary Medicine in Maryhill in September 2017. The car which was fitted with a distinctive roof rack was seen in the area of Mr Reilly's home in Maryhill Road, being driven towards Craigieburn Gardens between 21.30 and 21.40 on the night of the shooting. Afterwards, around 22.30, it was seen driving southbound on Maryhill Road, towards Glasgow city centre. It was later abandoned in New Lairdsland Road, Kirkintilloch, East Dunbartonshire. Attempts had been made to set it alight but very little damage was done. Det Chief Insp Wallace urged anyone with information to come forward. He said: "I am convinced there are people out there who hold information on Kenny Reilly's murder and for their own reasons, they have remained silent. "This could be due to fear of reprisal or misplaced loyalty. "I would urge anyone in that position to do the right thing and look to their conscience and contact us." The officer also stressed people can provide information in confidence. A Crimestoppers spokesman said: "Violence, on this level, with shots being fired into a car on a main road during the evening, is extremely distressing. "The victim leaves behind a girlfriend and a young son. "We are well aware that some people feel unable to speak directly to authorities, which is why our charity is here to give people options. "If you have any information about who was responsible for this attack, you can contact us and stay 100% anonymous by calling 0800 555 111 or by using our anonymous online form."